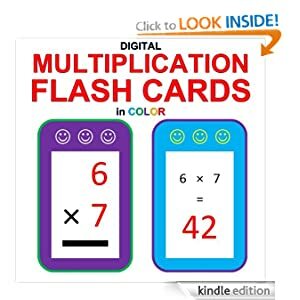 This eBook includes 162 digital multiplication flash cards in color (where color is available). Each flash card is decorated with smiley faces and looks just like the flash cards depicted on the thumbnail image for the cover of this eBook. The first set of 81 flash cards has the problems 1×1 thru 9×9 in order. The first half of this eBook is designed for kids who are still memorizing their times tables. The second set of 81 flash cards has the problems 1×1 thru 9×9 shuffled. The second half of this eBook is designed for kids who have tried to memorize their times tables, and who need to test their mastery of it. Each flash card appears as its own picture on its own page. All of the flash cards come in pairs: First comes the problem flash card, followed by the corresponding answer flash card. The answer flash card reminds you what the problem was. So first you see the problem, and then you check your answer immediately. This eBook reads like a book. It is not a program or a game. It does not use a random number generator. The flash cards do look like ordinary flashcards (and they are in color and are decorated with smiley faces). The first half of this eBook has the flash cards in order to help memorize the times tables. The second half are shuffled to help test how well the times tables have been memorized. The shuffled cards will always appear in the same order.